LOUISVILLE (WHAS11) -- Six JCPS schools and three Oldham County schools were ranked among the top 25 high schools in Kentucky by US News and World Report. 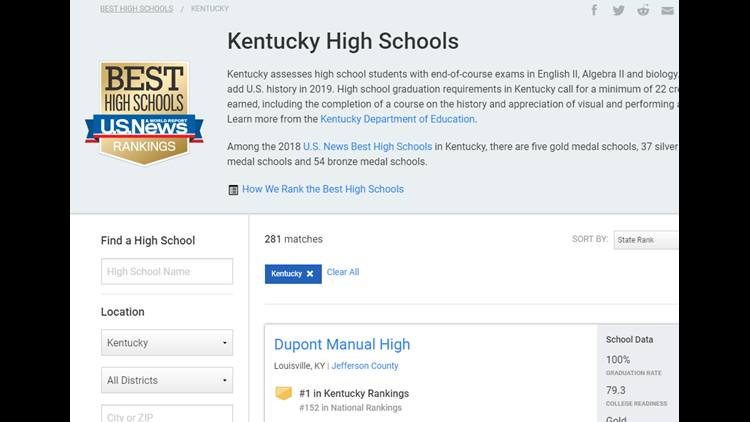 DuPont Manual High School was ranked #1 in Kentucky and #152 in national rankings. Other JCPS schools included Atherton (#6), Ballard High School (#9), Louisville Male High School (#14), Eastern High School (#15), and Brown School (#20). RELATED: Parents upset over state takeover of JCPS | JCPS Superintendent: "We can't stop the work"
North Oldham High School was ranked #4 and South Oldham High School was ranked #5. Oldham County High School came in at #17. The rankings come amid calls for a state takeover of JCPS by Interim Education Commissioner Wayne Lewis and reform of JCPS by Governor Bevin.